You hold in your hand a perfect pour. Through crystal glass, the golden hue dazzles the eyes. Magic bubbles rise obediently to the surface, clinging to the inside chalice like mountain climbers conquering a sheer ascent. Atop, the white foam head floats like a swan bobbing on bronze waters. However, one of the main components responsible for exciting the olfactory and taste receptors isn’t the beer’s water. It’s the hops. When a beer lover describes a particular brew as citrusy, tropical, herbal, floral, perfumy, minty, piney, or whatever – hops are at the heart of those flavor notes. Hops grow on vines that farmers “train” to crawl up vertical strings that are 16-18 feet tall. They train them by wrapping the vines around the strings in a clockwise direction. If the wrap is accidentally counter-clockwise, that vine will unwind itself and fail. Hop harvesting happens in early autumn when the flowers are picked off the vine and dried to a 10 percent moisture content. If not dried enough, they’ll spoil by the time they arrive at a brewery. If over-dried, they can lose their savory notes and potency – resulting in beer that lacks its intended flavor profile. After drying, the hops make their way to preservation mode inside a freezer set to 27-degrees Fahrenheit. Here they wait until a brewer orders a specific quantity of select hops. Then, they come out of the freezer, are milled into pellet form, and are shipped to the brewery where they mingle with water, malt, and other ingredients to become beer. In craft brewing, there are several varieties of hops – each selected to contribute unique, robust, and consistent flavor qualities to the beer recipe. To provide an idea of scale in hop varieties, visit St. Croix Valley Hops – a local hop grower. On just a five-acre Minnesota operation, St. Croix Valley grows 30 different hop varieties! 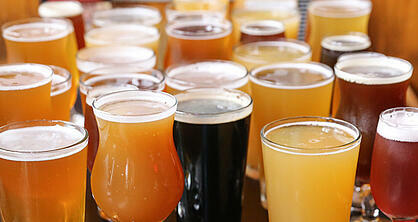 It’s no wonder that craft breweries can achieve such distinct flavors with such a hopped-up selection. Some of the most-used varietals in the craft trade include Cascade, Crystal, Chinook, and Nugget hops. However, each grower’s region, soil, climate, etc. will impart a unique and complex aura to those varietals. For example, Cascade hops grown at Farm A might have a very fruity essence; while the same hops from Farm B down the road might taste a little more piney. These nuances make the brewers’ job very exacting when it comes to sourcing hops – particularly when brewing large batches that MUST have case-to-case consistency to deliver on the brand’s promise to customers. Travel to the Pacific Northwest and there’s a hop farm around every curve of a gravel road. The region encompassing Washington, Oregon, and Idaho is responsible for growing a whopping 98 percent of the hops used in North America! More than 53,000 acres are dedicated to hops, and the region has the ideal climate for them to thrive. Compare that to Minnesota’s hop production, where only 120 acres are in hops. Of those 120 Minnesota acres, 80 of them lie on one farm, called Mighty Axe, in Benton County. It’s Minnesota’s biggest hoperation, and is quite a success story for its owners Eric Sannerud and Ben Boo. The two men started Mighty Axe as a college project while studying at the University of Minnesota. What began as 200 hop plants now totals more than 82,000 plants on 82 acres. The farm’s yield is vast enough to attract large-scale craft brewers like Minnesota-based Summit. While small craft brewers and brands releasing seasonals can buy hops in smaller quantities, a brand like Summit requires large hop shipments with reliable consistency that’s exact from plant-to-plant, year-after-year. It’s the only way to brew the same flavor profile into every run. Because, if a Summit Extra Pale Ale lover gets a batch that doesn’t deliver the same flavor, then you’ve got one ornery beer drinker on your hands. On the other end of the hop-growing spectrum in Minnesota are small operations like Metropolitan Hops in Corcoran, MN. 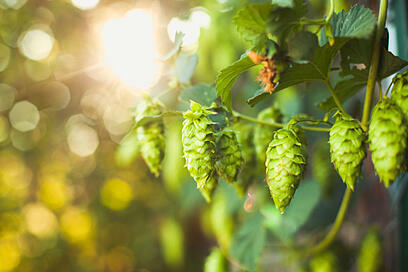 Here they grow on just a quarter-acre of quality soil and raise hops that capture the hearts of local craft brewers. By so doing, they’ve developed strong customer relationships and serious pride in the final product they all work so hard to achieve. Local sourcing is becoming increasingly important to people who truly care about brewing and drinking special beers. It’s the reason that brands like Castle Danger tout their use of Lake Superior water; or why Beaver Island is so passionate about sourcing their water from the Mighty Mississippi. Summit Brewing, who selects hops from the Northwest, the Southern Hemisphere and even Europe, reserves a special place in their heart for Minnesota hops. In fact, over the last five years, they’ve created several research beers in a pilot brewhouse using only Minnesota-grown hops. The recipes are intended for in-house evaluation as the brewer discovers new flavor profiles and makes decisions on commercial distribution. The home-grown connection isn’t just something happening at the hop grower and brewer levels. Distributors like Bernick’s also have their finger on the pulse of Minnesota’s rise in hop production and the great beer that comes from it. Part of our mission is to discuss the importance of local sourcing with our customers – whether it be a major retailer or a corner bar. Why? Because we know it’s a source of pride for a Minnesota beer lover to enjoy a Minnesota beer. The same can be said about other great beer states like Wisconsin, Colorado, Oregon, you name it. When something that’s near and dear to your heart, like hops and craft beer, also comes from someplace near your home – well, that just makes every sip even more special.